Despite their swoopy sheet metal and well-earned racing pedigree, the early Triumph TR cars aren’t super-advanced when it comes to the suspension. There’s precious little suspension adjustment available up front on the TR2 through TR4 in stock form, while the live axle used out back is about as basic as they come. 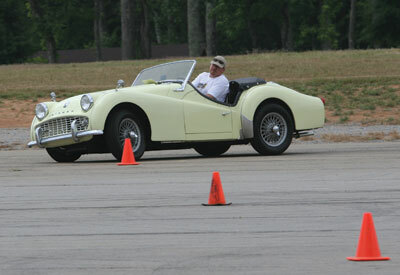 We came up against these limitations during our last vintage racing tire test, where we found that our 1957 Triumph TR3 just didn’t have enough negative camber to properly work with its new radials. The car was a little faster on the new Hoosiers than it was on its old bias-ply tires, but the increase in performance was smaller than expected. All is not lost though, as a few simple modifications can greatly improve the suspension on these cars. The parts that are needed for this surgery are far from exotic, and will help both street and race cars. Follow along and we’ll show you how we transformed our TR3. The alignment of a car’s wheels plays a large role in determining the size and shape of the tires’ contact patches during cornering. Negative camber, which is when the tops of the tires are canted inward, is used to counteract the effects of body roll. Given sufficient negative camber, the wheel will remain perpendicular to the road surface during even the hardest of cornering—which will maximize the contact patch. Whether you’re talking about street or race tires, radials generally function better with more negative camber than was preferred by the older bias-ply design. Unfortunately, it’s not possible to adjust the front suspension on a stock Triumph TR to get more than about half a degree of negative camber on each side. However, with a bit of ingenuity and some parts scrounging, it can be done. There are other suspension settings that can have dramatic effects on a car’s handling, and again, a few modifications can broaden the adjustment that’s available in these areas on the Triumph TRs. The TR6 upper control arms can also be shimmed to adjust the car’s caster (the forward or rearward tilt of the steering axis from vertical) to help high-speed handling and improve dynamic camber (the camber of the wheel as the steering wheel is turned). Shims are inserted between the ball joint and the arm; placing more shims in front of the control arm moves the ball joint backward, canting the steering axis toward the rear of the car (more caster). The trick to further adjusting caster is to use the upper ball joints from a Jaguar XJ6. These ball joints are 0.150 inch narrower than the TR6 pieces, allowing a little more wiggle room. Note that this setup requires two shims between the ball joint and the front half of the control arm to prevent binding. Here’s a way to get really trick for a Triumph race suspension: If you are running a track that favors turns in one direction over the other, you can run different caster on each side of the car to help turn-in. At Hallett, for example—which only has a couple of significant right-hand turns, but a lot of left-handers—we added more caster on the left side of the car. Since Road Atlanta has so many right-hand turns, we’ll run more caster on the right side of the car. Thanks to our modifications, we can now obtain 2.875 degrees of negative camber and 7.5 degrees of positive caster on our TR3. (Our real-world caster settings are usually between 3.5 and 5.5 degrees.) These settings will allow our radials to work well within their range for improved lap times. Lowering a car may make it look sportier, but there’s a practical reason as well: Lowering can improve the handling by keeping the center of gravity closer to the ground, thus reducing weight transfer and the resulting body roll. Don’t forget that lowering a car also reduces ground clearance. Like many things in life, there’s a quick and easy method for doing this as well as a more involved route, and the latter winds up working better in the long run. The quick and easy way is to install shorter front coil springs and leave it at that. However, simply lowering the car can throw off the suspension’s bumpsteer characteristics. In layman’s terms, bumpsteer can be defined as the suspension’s desire to steer the car as the suspension is compressed. If the steering is not designed properly (or if it’s compromised by lowering a car improperly or too much), the suspension’s up and down motions pull the tie rods in and out, steering the car in one direction or another. Depending on how severe the bumpsteer is, things can turn quite ugly on a bumpy track. Generally speaking, having the control arms level with the ground will reduce the bumpsteer problems. The proper way to lower a TR2, TR3 or early TR4 requires, once again, some ingenuity and parts scrounging. Start by substituting a Triumph TR6 trunnion and lower control arm bushing for the TR3 pieces. The TR6 spindle mates to the trunnion an inch higher up, thus moving the whole tire and wheel combination up this same amount. This trunnion also helps keep the control arm level with the ground, even after shorter springs are installed. These “bent” tie rod ends are from a late ‘70s and early ‘80s midsize Chrysler product, like the Cordoba. These ends put our tie rod perfectly level with the ground again. While it’s possible to bend the stock arms, we’d rather not risk having problems at cruising altitude. Now that our Triumph’s suspension could be lowered and adjusted to maintain the tires’ contact patches under hard cornering, we could concentrate on fine-tuning the spring and anti-roll bar rates. N=number of free coils, which is 6.125. Now let’s talk about anti-roll bars. An anti-roll bar is a spring of sorts, although it only works when the car is cornering or going over uneven surfaces. Over something like a speed bump, where both wheels cross the obstacle at the same time, an anti-roll bar has no effect whatsoever. As the car rolls during cornering, however, the bar is twisted and the torsion spring rate works to keep the car level. We don’t run a rear anti-roll bar on our Triumph TR3, but our 7/8-inch Addco front bar has been modified for adjustability. If you mount the Addco bar as intended, it will have a rate of 420.5 lbs./in. Drilling new end link mounting holes in 1-inch increments will shorten the lever arm of the bar and increase the effective rate. Our first new hole gives us 537 lbs./in., the second provides 637 lbs./in., and the third hole ups the rate to 900 lbs./in. G= material shear modulus, which is 1,125,000 [lbs./in.^6]. To stiffen the spring rate here, we just added one intermediate leaf to the rear springs. In addition, we added a 11/8-inch-thick lowering block. The lowering block goes between the spring and the axle and is secured by U-bolts that go over the axle and bolt to a plate that is under the spring. Obviously, longer-than-stock U-bolts are required. We’re also running Armstrong lever-action shock absorbers that have been modified with stiffer valving; they’re matched with Konis up front. We applied all of these tricks to our TR3 vintage racer during the off-season, and since the best test for a suspension is the track, we were eager to see how the car would perform at its first races this season. We were quite pleased to learn that the stopwatch says the car is much improved: It’s now 5 seconds per lap faster at Road Atlanta and more than a second faster at VIR—not bad considering we’re a little down on power compared to last year. We also finished first in class at a Corinthian Vintage Auto Racing event at Hallett, and second in class at the VIR Gold Cup event in June. The tire pyrometer agrees that the new suspension setup is performing better. Our initial testing with the new radial tires showed a nearly 100-degree differential from the outside of the tread to the inside—clearly the outside edges of the front tires were getting cooked, which is not the hot setup whether you’re talking about street or race cars. While these Triumphs were designed more than half a century ago, some parts bin engineering and ingenuity can make them handle like modern cars—or as close to it as you’d want.